Low supply pressure continues for merino wool. Home > Sheep > Low supply pressure continues for merino wool. 16 Apr Low supply pressure continues for merino wool. Supply in Australia continues to underperform for the broad merino categories, at a time when other greasy wool exporting countries are at a low point in their seasonal supply patterns. This article looks at the latest AWTA core test volume data, which allows a breakup of supply by micron category. Figure 1 shows the year on year change for March 2018 AWTA core test volumes by micron category, running from 15 micron and less on the left through to greater than 30 micron, then cardings and finally total volume on the right. The 20 through 23 micron categories, effectively the merino production on the broad side of the average fibre diameter of 19 micron, stand out as having the largest fall in March. 21 to 23 micron volumes are down by 35-40%, which is a large fall, complicated by the continued high level of vegetable fault in eastern Australia. As a check on single month variations in volume, Figure 2 shows the year on year change in volumes for the January to March period. It shows a slightly different view. However the 21 to 23 micron volumes are still down by 20-30% for the March quarter compared to a year ago which is still a large fall in supply. On the three month view, 17 to 19 micron volumes are up, as are the major crossbred micron categories. Overall the total wool volume for the March quarter is down by 2.5% compared to 2017, which does not tell what is going on for the different micron categories. So, what is happening? In March 2017 some 59% of 21 micron wool sold at auction came from four regions; the Great Southern in Western Australia (24%), the Midlands in Western Australia (9%), northern South Australia (16%) and southern South Australia (10%). While the auction and AWTA data are not directly comparable, the drop in 21 micron volumes in these four regions accounts for some 25% of the 39% drop seen in March AWTA volumes. In other words these four regions account for about two thirds of the change seen in 21 micron volumes. The four regions accounted for 58% of 21 micron sales in April 2017, before dropping back to around 40-44% by mid-2017. The seasonal conditions in these regions which has caused the current fall will not turn around quickly and given their continued importance to 21 micron supply in Australia, it seems likely the supply of broad merino wool will remain well below year earlier levels for the balance of this season. 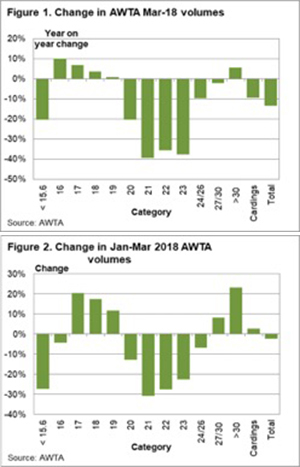 AWTA total core test volume fell by13% in March, and is down by a smaller 2.5% for the March quarter. Changes in total volume, however, mask some quite varied changes in volume between the different micron categories. 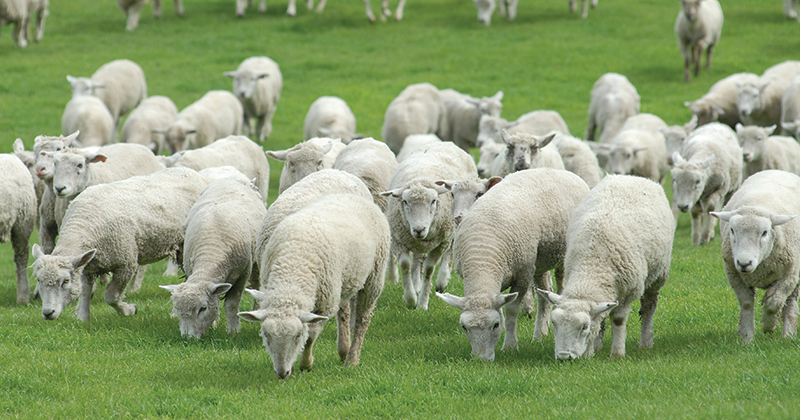 In terms of micron categories, the broad merino micron categories have fallen significantly this year. 17-19 micron volumes are up as are the main crossbred micron category volumes. The supply of broad merino micron wool is down by 20-30% for the three months to March and by more in March. Two thirds of this fall is coming from the Great Southern and Midlands in Western Australia and South Australia. These regions are likely to continue driving the supply of broad merino wool well below year earlier levels for the balance of the wool selling season, which should help support broad merino prices which in turn will help support medium merino prices.